Doris and Dude socks are a fun and stylish way to bring a touch of colour to your sock drawer. 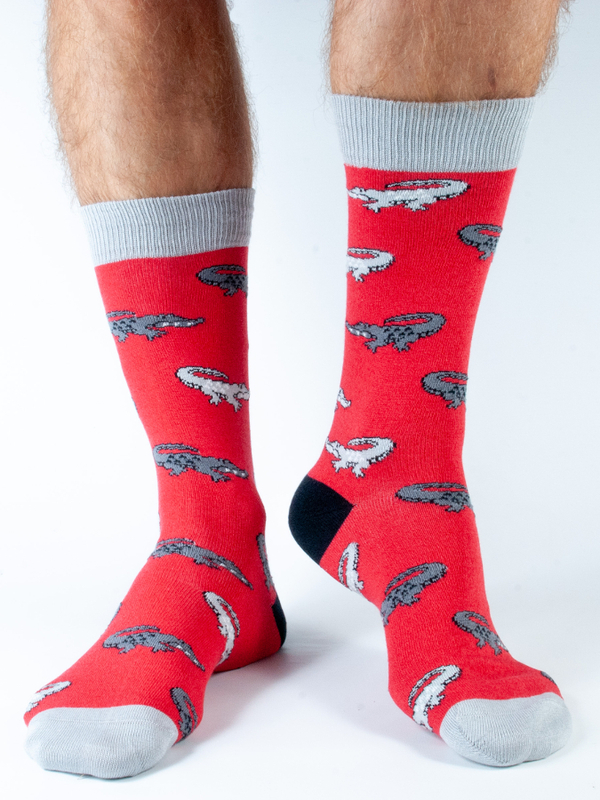 These red socks come with fun alligators on them, but it’s not the appearance of these socks that makes them stand out. The bamboo fibre used gives the socks anti-fungal and anti-bacterial properties, which gives them a breathable feel that keeps your feet comfortable even if you’ve been jogging. The material is coupled with organic cotton, polyester and elastane to give the socks a luxuriously comfortable feel and an accommodating fit. The Doris & Dude Men's Red Alligator Bamboo Socks product ethics are indicated below. To learn more about these product ethics and to see related products, follow the links below. There are currently no questions to display about Doris & Dude Men's Red Alligator Bamboo Socks.